A KhanGhiath A. Saied Consultant MD, FRCS(C), G Saied, F Emran, M Din. IVC Thrombosis: A Preoperative Surprise In A Young Patient Of Acute Appendicitis. The Internet Journal of Surgery. 2009 Volume 26 Number 1. Venous thrombosis is a well-known complication of acute appendicitis, like many other intra-abdominal septic conditions. These events can present peripherally in the form of deep vein thrombosis of the lower extremities, or more centrally as pelvic thrombophlebitis. However, an inferior vena cava thrombus is a less common phenomenon in general and especially rare in patients with no thrombophilic diseases. In this case report, we present a case of acute appendicitis with an IVC thrombus. An approach to the management in such a patient population is discussed. Venous thrombosis in young patients below 30 years is a very rare albeit known condition with the life-time risk of venous thrombosis being 0.1%1.Inferior vena cava thrombosis (IVCT) is an uncommon condition and is usually associated with secondary causes such as peripheral deep vein thrombosis (DVT), systemic coagulopathy, abdominal surgery, tumors, Budd-Chiari syndrome, infections or rarely it could be idiopathic2-3. 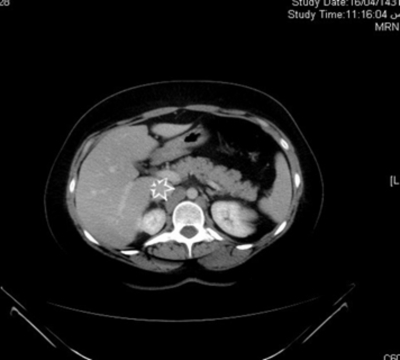 The occurrence of IVCT in association with acute appendicitis is an extremely uncommon event and after an extensive literature review we could not find such a case reported before. A 28-year-old unmarried female presented to the emergency room with crampy, mid-abdominal progressive pain of three days duration, which later localized to the right iliac fossa. The pain was associated with nausea, frequent vomiting, anorexia and mild fever. She had a couple of loose bowel motions the day prior to presentation. She denied respiratory and genitourinary symptoms or any symptoms suggestive of connective tissue or hematological disease. Her past history was remarkable for mild asthma controlled by salbutamol inhaler. There was nothing of note in family history. Physical examination revealed her to be alert and oriented, in mild distress because of pain. She was normotensive with a temperature of 38.6 and heart rate of 104/min. The cardiorespiratory exam was within normal limits. The abdominal exam revealed tenderness and guarding in the right lower abdomen. Groin, genital and lower limb examination was within normal limits. Her laboratory findings revealed a hemoglobin value of 98g/l (normal 120-150g/l), a leukocytosis of 13.1x109/l (normal 4.0-11x109/l) with a neutrophilia of 0.89 (normal 0.56 proportion of 1) and normal platelet count. The basic metabolic panel was within normal limits. A CT scan was ordered to rule out complicated appendicitis in view of delayed presentation and systemic signs of infection. Findings on CT scan of the abdomen were consistent with acute appendicitis without mass formation with reactive iliac lymphadenopathy and IVC thrombosis as shown in the figures 1 and 2. Fig. 1: Longitudinal reconstructed CT of abdomen and pelvis demonstrating a dilated (9mm) tubular structure with contrast-enhancing wall and no contrast in its lumen (white arrow) associated with right iliac fossa fat stranding and enlarged lymphnodes (red arrows) in the vicinity of the right iliac vein. Fig. 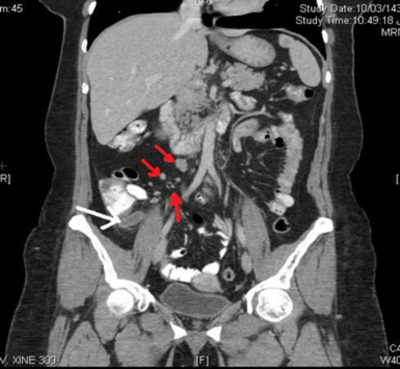 2: Longitudinal reconstructed CT scan of abdomen and pelvis showing a filling defect (black arrow) in the IVC extending from the right common iliac vein to the level of the renal veins, likely representing a thrombus. The patient was commenced on NPO, intravenous fluids and Tazocin® (piperacillin + tazobactam). Septic screening was done and blood was drawn for thrombophilic work up on the hematologist’s recommendation. The decision was made to place an IVC filter preoperatively (joint decision of hematologist and interventional radiologist) and a retrievable suprarenal inferior vena cava filter placement ensued without complications (Fig. 3). Fig. 3: Cross-sectional CT of the abdomen showing IVC filter in place. This was followed by open appendectomy and local findings at operation revealed a turgid congested appendix lying over the psoas muscle in proximity to the iliac vein with massive edema and inflammation of surrounding tissues and lymphadenopathy. Anticoagulation was started 6 hours post-operatively with heparin which was changed to low molecular weight heparin (LMWH) in the form of Clexane® 80mg subcutaneously b.i.d. Thrombophilic work-up returned normal. Meanwhile, blood culture grew E. coli sensitive to Tazocin. The patient was discharged from the hospital on the 4th post-operative day without complications on clexane and oral antibiotics. The patient was readmitted for possible removal of the IVC filter 3 weeks later. However, there was evidence of IVC filter thrombosis and the procedure was abandoned. The patient was switched to oral Coumadin with a target INR of 2-3, and regular follow-up with internal medicine. Thrombosis of IVC is an under-recognized clinical entity with a variety of clinical presentations and it represents a subset of DVT. Virchow described the triad of stasis, vessel injury and hyper-coagulability as the causative factors for DVT4. Endothelial damage is invariably an acquired phenomenon whereas hyper coagulability may result from both congenital and acquired risk factors. Our patient presented with acute retrocecal appendicitis, iliac reactive lymphadenopathy and associated inflammatory changes. 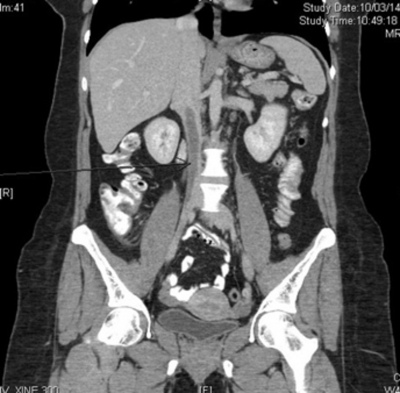 She had right iliac and IVC thrombosis extending just below the opening of the renal veins. The possible explanation for thrombosis in our patient is local infection leading to endothelial injury owing to close association of the inflamed appendix with the iliac vein. Infections can possibly cause venous thrombosis by local invasion of surrounding tissues, compression, and direct endothelial damage, and also contribute by producing transient hyper-coagulable states5. In the presented case, compression of the iliac vein by enlarged lymph nodes induced both venous stasis and turbulent flow which facilitated thrombus formation. Another possible etiology for this patient is the disruption of balance between coagulation and fibrinolytic system due to systemic infection which induced hyper-coagulability and thrombogenicity6. In fact, sepsis is the dramatic link between inflammation and thrombosis. When gram-negative bacteria release their endotoxins in the blood stream, the lipopolysaccharides induce a change in the lining of blood vessels from anticoagulant pro-fibrinolytic surface to one that promotes thrombosis. Endotoxins stimulate the production of tissue factor. Endotoxins also augment the production of plasminogen activator inhibitor which inhibits fibrinolysis and the balance is tipped in the favor of thrombosis6. There was enough evidence for systemic infection in the presented case in the form of systemic signs of infection and positive blood culture. Our patient presumably started with thrombosis in the right iliac vein which than propagated up to the IVC. Current treatment options for IVCT are medical management with anticoagulants, thrombolytic or mechanical in the form of suprarenal vena cava filter placement. Absolute indications for IVC filter placement are contraindication to anticoagulation therapy, recurrent thromboembolic disease despite anticoagulation therapy or complications of anticoagulation. In the presented case, a suprarenal IVC filter was placed as the patient had to be operated for acute appendicitis and anticoagulation was resumed in the form of LMW heparin 6 hours after surgery. Despite the potential for large lethal PE, heparin therapy appears to be the appropriate form of treatment for patients with IVC thrombosis3 and LMWH has proved to be as effective and safe as un-fractionated heparin for prevention of PE9. Duration of anticoagulation therapy is controversial. Our patient was scheduled for removal of IVC filter 3 weeks later but the procedure was abandoned due to thrombosis of IVC filter. Although she was asymptomatic, she was put on coumadin with a targeted INR of 2-3. IVC filter thrombosis manifests as recurrent deep vein thrombosis or PE in a high proportion of patients and the role of continued anticoagulation in such cases has been emphasized10, whereas others have found that anticoagulation has little effect on the resolution of filter thrombosis and future occurrence of PE11. Acute appendicitis associated with IVCT should be managed along usual lines. In patients deemed for surgery, as full anticoagulation is contraindicated, the placement of a retrievable suprarenal IVC filter is a treatment option to prevent PE and the need for anticoagulation should be re-assessed later. 1. Anderson FA, Wheeler HB, Goldberg RJ, Hosmer DW, Patwardhan NA, Jovanovic B et al. Population based perspective of the hospital incidence and case fatality rates of deep vein thrombosis and pulmonary embolism. Worcester DVT study. Arch Intern Med 1991; 151:933-93. 2. Hamid SA, Abdullah BJ: Bilateral pyogenic psoas abscess with inferior vena cava thrombosis. J HK Coll Radiol; 2008; 11: 44-46. 3. Faber SP, O'Donnell TF, Deterling RA, Millan VG, Gallow AD: Clinical implication of acute thrombosis of inferior vena cava. Surg Gynecol Obstet; 1984; 158: 141-144. 4. Virchow RLK: Handbuch der speciellen Pathologie und Therapie. Vol. I. Erlangen, Germany: Ferdinand Enke; 1854; pp. 95-270. 5. Gogna A, Pradhan GR, Sinha RSK, Gupta B: Tuberculosis presenting as deep vein thrombosis. Post Grad Med J; 1999; 75: 104-5. 6. Libby P, Simon DI: Inflammation and thrombosis: the clot thickens. Circulation; 2001; 103: 1718-20. 7. Jackson BT, Thomas ML: Post-thrombotic inferior vena caval obstruction. A review of 24 patients. Br Med J; 1970; 1(5687): 18-22. 8. Zerhouni EA, Barth KH, Siegelman SS: Demonstration of venous thrombosis by computed tomography. Am J Roentgenol; 1980; 134: 753-58. 9. Decousus H, Leizorovicz A, Parent F, et al. : A clinical trial of vena caval filters in the prevention of pulmonary embolism in patients with proximal deep-vein thrombosis. Prévention du Risque d'Embolie Pulmonaire par Interruption Cave Study Group. N Engl J Med; 1998; 338(7): 409-15. 10. Tardy B, Mismetti P, Page Y, Décousus H: Symptomatic inferior vena cava filter thrombosis: clinical study of 30 consecutive cases. Eur Respir J; 1996; 9: 2012-16. 11. Ahmad I, Yeddula K, Wicky S, Kalva SP: Clinical sequelae of thrombus in an inferior vena cava filter. Cardiovasc Intervent Radiol; 2010; 33: 85-89.